On 6 January 1171 Henri de Blois, Bishop of Winchester, ordered under charter that "the appropriations of churches to the Sacrist and the Hospitallers of Jerusalem shall continue as they have been assigned'. . . . .the church of Littletone for the reception of guests. . . . ." In practice this meant that revenues from the church were due to the Guestmaster at St. Swithun's Priory, who used them for the entertainment of guests, including pilgrims to St. Swithun's shrine. Supplies of grain, stock, poultry and dairy products from the Manor of Littleton were also delivered regularly to St. Swithun's, and recorded in the accounts of the manorial reeve. This order was confirmed by Pope Innocent III in 1205 and again by Pope Innocent IV in 1243. 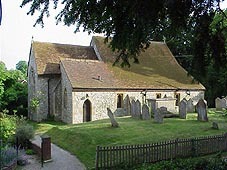 It seems that by this time Littleton was no longer part of the manor of Chilcombe, and that the Bishop of Winchester had retained the patronage. The Black Death first visited England in 1348 and brought with it great hardship and inevitably smaller numbers of survivors to cultivate the land. Plague struck Littleton in 1364 and parishioners failed to pay their manorial dues as a result. In March 1373 Bishop William Wykeham licensed John Hyde, the Monk-Guestmaster of St. Swithun's Priory "to hear confessions and administer the Eucharist at Littleton during Lent and Easter because, owing to depression of the times, the parishioners could not afford a chaplain". This licence was renewed annually until 1379. The plague also meant that there was a severe shortage of clergy. Following the upheaval of the Reformation, the Manor of Littleton was granted by Letters Patent Henry VIII in 1541 to the Dean and Chapter of Winchester Cathedral. Chaplains, and later perpetual curates. were nominated by the Prior before the dissolution of the monasteries and afterwards by the Dean and Chapter, and licensed by the Bishop. The first vicar, the Rev. A.G. Garland, was appointed in 1871. 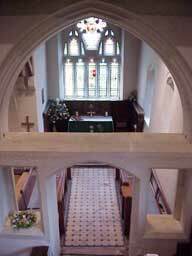 On 6 July 1909 the London Gazette recorded the exchange of the patronage of the benefice of Hunton for that of Littleton, and then Littleton was joined to Crawley with the first Rector of the united parishes being appointed in 1918. 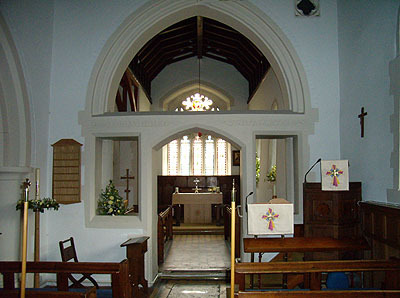 By the late 1980s the Rector had also been appointed Vicar of St. Stephen's at Sparsholt with Lainston, reflecting the shortage of clergy, yet opening the way for greater community of worship among the three parishes. The church is dedicated to St. Catherine of Alexandria, Virgin and Martyr, although there have been earlier references - in 1886, for example, after the restoration - to St. Mary, meaning to St. Mary Magdalen. The legend surrounding St. Catherine is both well known and unsubstantiated. She is said to have defied the emperor Maxentius' efforts to break down her faith: an unsuccessful attempt was made to destroy her on a spiked wheel (the catherine wheel). This is thought to have happened in 307 AD., and a corpse discovered on Mount Sinai early in the 9th. century was regarded as hers after it had been carried there by angels following her death.